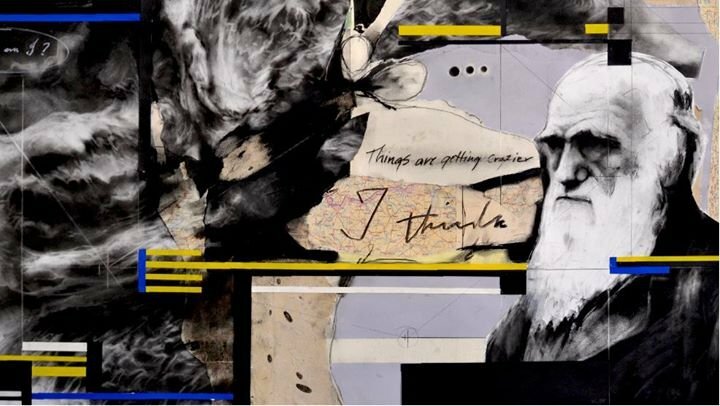 Artist Mario Abela uses charcoal drawings, collage and sound that depart from the metaphysical, scientific theories and history. Through a juxtaposition of images and chance during execution, what starts as storytelling, becomes an exploration into fantastic, dislocated geographies. This puts concepts like time and chance under analysis, to establish how these determine the interpretation of the past and sometimes forecast the future. Dislocated Geographies investigates what we think is natural but unpredictable and what seems familiar but is actually strange. While chance has played a significant role in many groundbreaking scientific discoveries, human life and nature have been profoundly impacted by each scientific breakthrough. In the artist’s view, the human species has been conditioned irrevocably by, and through, complex visual representations of the scientific theories and events that try to define our existence in the cosmos. It is through the abstraction of these theories into visual processes that one is able to experience a true, and accessible, sense of the Sublime. Mario Abela is an artist and graphic designer with a Masters Degree in Fine Arts – Digital Art. His current work is experimental, working mostly in a large format with charcoal on paper. Dislocated Geographies is supported by Gozo Arts Furnishings Limited and Gozo Prime Properties. This event is part of the Spazju Kreattiv Programme.